Beach house atop Halls Bluff across street from Nantucket Sound. Outdoor shower has easy access to back deck. Morning sun on deck is glorious! Living room accommodates large crowd for family time, any time. View from dining room toward sun room, with afternoon light. Upstairs 3rd bedroom is a quiet nook for one person. Our airy and comfortable beach house features tranquil water views, a large 22 x 11 foot elevated back deck, 4 bedrooms, 4 bathrooms, and a cozy sun room with a full entertainment center. Hardings Beach is just a short five-minute walk away, using the bluff’s private path. The house is perfect for two families, and welcoming for young or older children. Guests enter into the oversized living room and connected dining room. The living room runs front-to-back of the house, and the adjacent unenclosed dining room overlooks the back deck through sliding glass doors. With glorious morning sun, back deck is the crown jewel of the house. It has a teak table and chairs, and two reclining teak loungers, and is always ready for a crowd! Steps down to the backyard lead to gas grill and oversized outdoor shower. 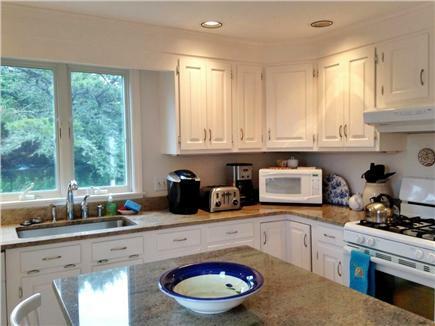 A granite and white kitchen adjoins to the deck and dining room. The kitchen features an ample granite island that serves both as a cook's work-space and breakfast ledge with stools. Off the living room is a welcoming sun room with a small front deck that gets sublime afternoon sun. The cozy sun room includes partial views of the water on two sides, an entertainment center with plasma TV, DVD / CD player, stocked game cabinet, summer reading bookcase, and WiFi console. The couch opens up into a queen-size pull-out bed, in a pinch. Upstairs there are two large, open bedrooms, also stretching from front-to-back of the house, both with expansive ocean views. The master bedroom has a king size bed, private full bath with shower, a walk in closet, plasma TV and DVD player, and small desk for contemplation. The second bedroom includes another king size bed, plus two twin beds for kids, a walk in closet, and ample drawer space for storage. The upstairs hallway features another full bathroom with tub, a storage closet, plus a third bedroom (between the master and second bedroom) with a single twin bed, perfect for a teenager or single adult. The finished lower level functions as a house-length play room, with a sliding glass door to the backyard. The lower level also includes the laundry room with washer, dryer, and sink; a full bathroom with shower; a full-size futon couch/bed, if needed; an upright piano that keeps in key surprisingly well in the summer; and an access door to the garage. The garage houses a ping-pong table with accessories, beach umbrellas and chairs, and other sundried fun beach items. It may even have our kites from last year (!). The front and side yards are open and well suited for outdoor games. A circular driveway in the front yard, as well as a sloping driveway to the garage, provide ample room for parking. An oversized, outdoor shower hides behind the shrubbery on the right of the house. The backyard is open, but slopes downward and is unfortunately not optimal for games or sunning. The house is on a private, paved road that is owned by the “Halls Bluff Association,” made up of the owners of the 20 or so homes on the bluff including Kemah, Harbor View, and Pine Grove Roads. The association maintains the roads and a private path to the beach at the end of Kemah Road. Surrounding Halls Bluff are quiet marshlands with private homes, perfect for walks and contemplation. 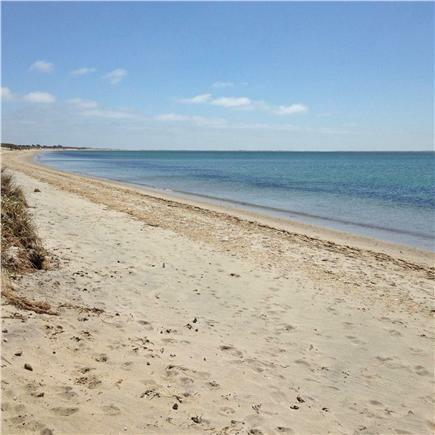 All guests are welcome to use our private path to Hardings Beach, a shallow, typically serene beach along Nantucket Sound. The beach a short, 5-minute walk from the house. Hardings Beach has a well maintained bathroom, lifeguards in the summer months, and often hotdog and ice cream trucks for kids. What could be better! Down Hardings Beach to the east is old Stage Harbor Lighthouse, just a leisurely mile or so walk down the beach. It was the the first lighthouse in Chatham (1878) and is no longer in service. Its a pleasant walk to the lighthouse to collect shells with kids, or to stretch your legs. Long-Term Rental (1 month or more): We welcome long-term renters from October to May. Rental rate is $2500 per month, utilities not included. Additional pricing info: Additional cleaning fee of $300 / stay, additional pet fee of $50 / stay. State and local taxes of 12.45% will apply. First floor bath is wheelchair accessible, and the shower is large enough for a shower chair. The first floor bedroom can also accommodate a wheelchair. We loved having you with your friends and family, Teresa. This was our first off-season rental EVER, so your feedback is so important to us. We will up our "cleaning game" in the off-season. Thank you! We had a wonderful stay in Chatham! We took the whole family - Grandparents, two young families with toddlers, and a family dog, and the house was just perfect to accommodate us. We had plenty of space and the house was very kid friendly. We especially enjoyed the playroom for the kids and the deck for dinners with a beautiful sea breeze. The kids loved playing in the yard and the adults loved being able to spread out and have some space to ourselves even with our very full family trip. 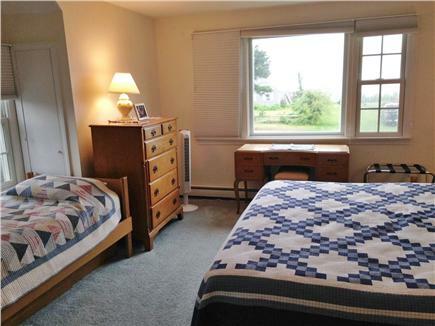 Each family was able to have their own large bedroom and bath. Our family has owned this property since 1995, and we truly love this house. My father, Lloyd, loved nothing more than spending time by the ocean or the beach, and this house was his baby. We grew up outside of Boston, and each summer we would follow dad around the Cape and Islands on his quest for the perfect beach house; Falmouth, Dennis, Yarmouth, Harwich, Brewster, Chatham, and Edgartown were all destinations we tried during our two week summer vacations. When he found this house on Halls Bluff in Chatham, he knew he had stumbled upon the spot he had been searching for all those years. Our family has always spent part of the summer in the house since then, and has shared it with people like you for the rest. My mother still lives in the Boston area, and my sister Alexandra and I, although now grown ups, are still beach lovers just like our dad. The deck is amazing in the summer. The sun gets so hot out there sometimes, you can't stay too long without the protection of the table umbrella. At night the stars are clear and the breeze warm and we want nothing more than to hang around the citronella candles with our wine glasses and gab all evening. Another special thing about the house is all the nooks and crannies that people can get lost in. The interior stretches across three floors (from lower level, to main level, to upstairs) and four bedrooms, so if you want to find a little place to escape, you can. While there are great expanses of space to gather in and have together time, there is also room for alone time, which is just as valuable on a summer vacation. A final thing I love about this house is the sun room. Despite being small, it truly is a cozy place to relax. Many a book has been read on that green couch, and many a family movie has been enjoyed by all - crowded into that sandy-colored room. I think that's actually why I love that room so much: those sandy-yellow walls conjure up the beach even when you're not physically at it. One can feel at peace in that sun room.